Aerofoil 1.4 is now available to download! - Allows manual enabling/disabling of Aero Glass. 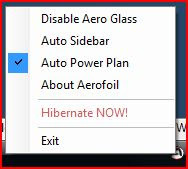 - Hibernate option added for quick access. - User guide included (just a simple text with FAQ). - Issue with Vista ignoring Aerofoil's (automatic) re-enable Aero Glass requests should be fixed. - Tray icon tooltip is not so eager to appear. - Tiny memory leak fixed (only occurred on exiting Aerofoil). Thanks for this app, I was going to write something myself, but since you've done the work for me I think that I'll be just as happy using your little tool. I talk to people and they swear black and blue that Vista Aero uses no more power than Basic but I am finding that I get roughly 25 to 50% more power from simply dropping to Vista Basic. Great work u did with that newer version. I'm going to watch ur code the next days to have a closer look, what u did exactly. I'd wonder if it would be possible to customize the power plan that will be used for plugged and unplugged mode. This is because ASUS laptops create their own energy plans that work with their "switch profile" button. Also some other nice features would be disabling WiFi and Bluetooth. I get an error saying that one or both of my min max power plans are not available? That would be because you probably don't have the default minimum or maximum power plans provided with Windows Vista. Sorry I need to go a bit technical here - these two plans (of three total) are programmatically identified with specific IDs (GUIDS) provided by Microsoft, so no matter which language you use on Vista (and thus names for the power plans), these should always be there. The only reasons I would think they wouldn't be available are because they have been deleted (accidentally or corrupted registry), have been removed for some reason by your computer manufacturer, or have otherwise changed their ID. Aerofoil is intended to be as simple, small and fast as possible and thus can only switch between these two plans and hence needs them to start. Additionally, some manufacturers may also still design their hardware drivers to power save only when using the specific Vista default power save plan (e.g. underclock - slow down - on Nvidia graphics cards) so it is of benefit that only these two power plans used. If you don't manage to solve your missing power plans problem, slightly bigger applications, VistaLaptopBatterySaver or VistaBatterySaver may be what you are looking for, since this will pick up all of your power plans and should(?) ignore the missing defaults.